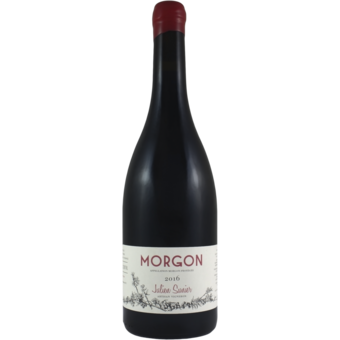 "The Morgon from Julien Sunier hails from two different parcels, both of which are fifty- plus years of age. Like all of his wines, the Morgon is fermented in cement and raised in older Burgundy casks that Julien buys from his old mentor, Christophe Roumier in Chambolle. The 2016 Morgon is beautifully expressive already on both the nose and palate, with the bouquet wafting from the glass in a fine blend of cranberries, red plums, lovely soil tones, violets, bonfires and a touch of mustard seed in the upper register. On the palate the wine is fullish, tangy and still young, with fine intensity of flavor, moderate tannins, good acids and a long, tangy and youthful finish. This is a touch leaner in 2016 than in past vintages, which I assume is a reflection of some hail impact in one or both of the parcels (one of these lies on the Morgon- Re´gnie´ border and most certainly was hit), but the wine is quite clean and just a touch less plush at the core than is customary. Give it a couple of years to blossom. 2019-2040." The 2016 Morgon comes equipped with a bundle of pure red cherry, wild strawberry and raspberry on the nose. This just unfurls beautifully, becoming quite floral with time. The palate is medium-bodied with crisp acidity. You can feel the energy in this Morgon, and though it is not as persistent or as voluminous as the 2015, there is impressive precision here. Give this a year after bottling before reaching for the corkscrew.